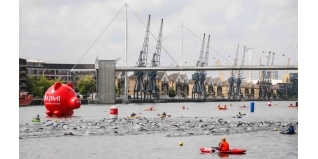 News from the ExCeL Centre in London is that Australian Peter Kerr has taken the 2015 win, running away from a group of British men to cross the tape 27 seconds clear of Welsh Commonwealth Games athlete Liam Lloyd, with last years second placer David Bishop taking third. After a horrible race at Tri Liverpool recently, Bishop will be happy to have bounced back well. With Kerr taking the race win, that means that Liam Lloyd is the new British Elite Standard Distance Champion. The Super Series leader before today and recent Tri Liverpool winner, Morgan Davies, was ninth - but subject to confirmation, we think that will be enough for him to take the 2015 Super Series title. Another 'bounce back' performance is that of Helen Jenkins. The class athlete of the field, victory was not unexpected but after having to withdraw after the swim section last week at the Rio Test Event after been kicked in the water, there's no better way to get over that than with a convincing win on home soil. She had a breakaway on the bike with Australian Charlotte McShane - the World Under 23 Champion in 2013 - before pulling away strongly on the run for a clear margin of victory.